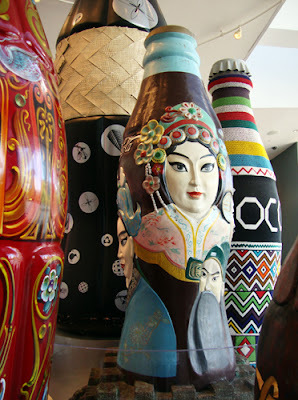 The World of Coca-Cola is an international experience from the moment you walk in until the grand finale of your visit, which consists of sampling Coca-Cola products from around the world. The Coke bottles in this photo are in the lobby where visiting guests congregate immediately prior to entering the Happiness Factory Theater! Coke's new film, "The Great Happyfication," takes visitors "on a musical journey through a fantastic world inside a Coca-Cola vending machine, where Happiness Factory workers share their secrets for finding happiness." One of my favorite stops along the excursion of the World of Coca-Cola is the happenstance meeting of the Coca-Cola polar bear. I've not yet had the opportunity to have my photo made with him (or her...I'm not sure which), but know that that is one that will definitely make my personal Facebook account, and maybe I'll post it here as well.